Books Njoku, M. G., Anieke, C. C., & McDevitt, P. J. (2015). Frontiers in Education. Advances, Issues and New Perspectives. Enugu: ABIC Books and Equip. Ltd. Anieke, C. (2014). Chinua Achebe’s Trilogy: A Study in Bicultural Communication. Enugu: ABIC Books and Equip. Ltd. Anieke, C. (2014). La Trilogie de Chinua Achebe: Une etude de la communication biculturelle. Enugu: ABIC Books and Equip. Ltd. Njoku, M. G., & Anieke, C. C. (2011). Stories of Peace. (Eds.) New Generation Publication: Enugu Anieke, C. C., Chidili Rosaline and Ada Ogbozor (2009). Njem Goliver Jere (A Translation of Swift’s Gulliver’s Travels into Igbo) Editor/Commentator Anieke, C. C. and Andreas Hunger (2008). A Dictionary of German, English and Igbo Anieke, C. C. (2005). Intercultural Problems of Communication: the (Re) Presentation of the Igbo People and their Culture in Achebe”s Things Fall Apart, Arrow of God and No Longer at Ease Anieke, C. C. (2004). The Representation of the Igbo People and Culture in Achebe’s Things Fall Apart Anieke, C. C. (2002). Hybrid Formations in English. Munich, Germany Anieke, C. C. (2000). The Symbol of the Dove at the Baptism of Christ Anieke, C. C. (1996). Enwizdomization Forum (Co-Ed). Journal of Philosophy of Seat of Wisdom Seminary Owerri Anieke, C. C. (1994). Metaphysics as a Natural Disposition in the Philosophy of Immanuel Kant >Papers Anieke, C. C.; Dele Maxwell Ugwanyi (2015).”Criteria for Aesthetic Judgment in the Igbo Traditional Society”,SECL Studies in English and Comparative Literature. Literature in English: New Frontiers in Research.Vol. 24, P. 69-78 Anieke, C. C. (2013). Criteria for Aesthetic Judgment in the Igbo Traditional Society. Presented at International Conference on Post Colonial Literature at Innsbruck Anieke, C. C. (2007). The Difficulties of Translating Swift’s Gollivers Travels into Igbo presented at International Conference on Literature in English at Barcelona Anieke, C. C. (2006). Nature of Ecumenical Education presented at a Conference Organized at the 25th Anniversary of the Institute of Ecumenical Education, Enugu. Anieke, C. C. (2006). Reappraising the Achievements of Chinua Achebe in his Novelistic Trilogy presented at a Conference Organized at the 25th Anniversary of the Institute of Ecumenical Education, Enugu. Anieke, C. C. (2005). Intercultural Problems of Communication and Understanding in Achebe’s Novels presented at International Conference on Literature in English at Innsbruck Anieke, C. C. (2005). Intercultural Problems of Communication and Understanding in Achebe’s Novels presented at the International Conference on Post Colonial Literature at Innsbruck Anieke, C. C. (2006). Slavery in Literature: An African Perspective presented at the International Conference on Post Colonial Literature at Innsbruck Anieke, C. C. (2004). Chinua Achebe and Misrepresentation of African Women in Things Fall Apart presented at a Faculty Seminar at University of Innsbruck. Born in Port Harcourt on October 1, 1965, Prof. Anieke got his first degree in Education and English from the prestigious University of Nigeria, Nsukka. After his graduation, he felt called to serve God as a Catholic priest. He was admitted to Seat of Wisdom Seminary, Owerri, which is in affiliation with Urban University in Rome, to study Philosophy. After his degree in Philosophy, he was sent by his Local Ordinary to study Catholic Theology at the University of Innsbruck. 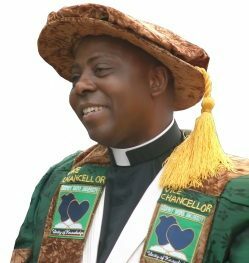 Having been ordained Catholic priest on 22 July 2000, he went ahead to obtain the following degrees: a master’s degree in Biblical Theology, a master’s degree in English and American Studies and a PhD in English. His research and studies took him to Bath Language School, Stratford-upon-Avon, Oxford University, Glasgow and University of Muenster where he worked under Prof. Wolfgang Zach and Prof. Herman Real. Prof. Christian Anieke became a visiting professor of Enugu State University of Science and Technology in 2006. He founded Godfrey Okoye University for the Catholic Diocese of Enugu in 2009. He is currently the Vice Chancellor of Godfrey Okoye University. He is a native of Ezeagu in Enugu State and also an honourary citizen of Mitterikirchen, Austria.